LEVEL LOT!! EXPANSIVE VIEW!! APPROXIMATELY 400 FT OF WATER FRONT AND SEA WALL!! Three Bedrooms. Two Baths. Open Kitchen Dining and Great Room. Sun Room Overlooking the Lake. 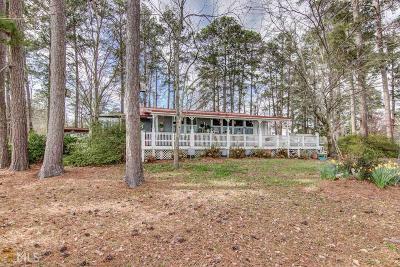 Covered Porch and Open Deck Lakeside. Tussahaw Section of Lake. Has Mature Fruit Trees, Blueberry Bushes and Flowers. Covered Dock with Lift and Swim Platform Plus A Deck Over the Lake Plus a Boat Ramp Area. ALL THIS AND PRICED UNDER $300,000.00!!! Directions: From Jackson. Highway 36 E. Cross Rr Tracks And Turn Right On Stark Road. At 4 Way Stop, Turn Left On Halls Bridge Road. Turn Right On Strickland Pasture Road. Follow Strickland Pasture Road Almost To End. Turn Left At Directional Sign And House On Right.